No matter the website, the design always follows a set of rules to ensure functionality and accessibility. Companies have to make sure that clients are able to enter that virtual space and make their way safely, and successfully, around. The way that a website is designed has huge effects on the way that users will interact with it. A site crammed with thousands of options, complicated menus and slow loading graphics will be less successful in retaining visitors then a site that is easy to navigate and free of cluttered. Finding out which design, navigation structure and colour scheme is right for a company can be a long and difficult one of trial and error. There are, however, companies out there who have nailed the art of superb website design. 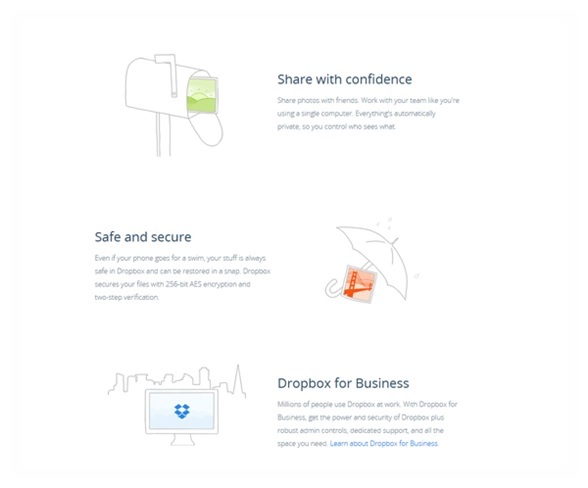 Fulfilling all you online storage needs, Dropbox is a prime example of brilliant design. With a minimal and simple colour palette, a stripped-back illustrated, playful presentation, and a balance between the textual and the visual, everything you need to know is in one clean space thanks to one page scrolling. Atop of that, the navigation couldn’t be simpler: sign up or sign in. This savvy online company has done something few others can boast: they’ve turned work into fun. Bose have thrown out the white minimalist design so common with electronics now, and dived into the dark side with gun-metal and a flash teal. Why does it work? Because the colours break the mould and they do it with style. 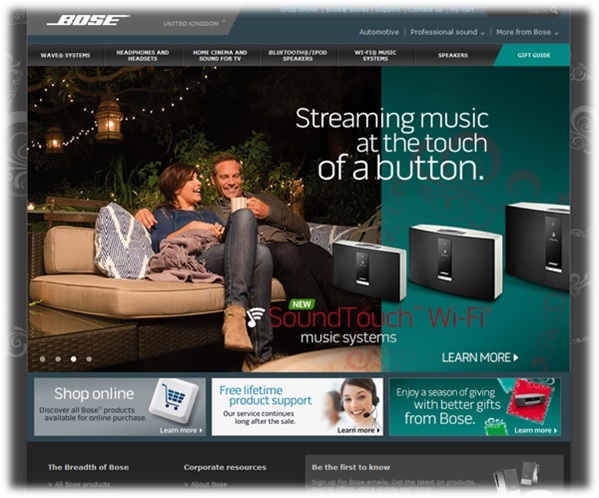 All the more, Bose adds the human touch by showing people using their gear. They’ve adopted an interactive photo stream to display a lot of information without taking up too much space, and provide everything the buyer needs – online shopping and customer support – in the click of an embedded button. This social media company doesn’t need explanations. 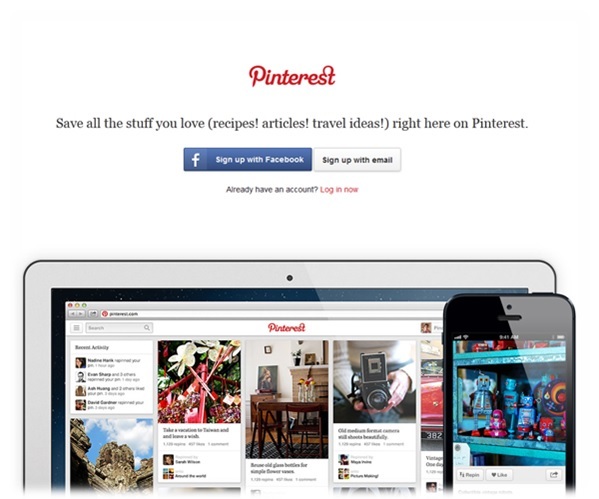 Pinterest illustrates its function with a clever visual aid, a snapshot of the site in action on mobile devices. It suggests and helps you out, instead of getting pushy, and keeps everything neat and easily accessible, yet unobtrusive. The design provides the opportunity to find out more without obscuring the function of the site. Pinterest have managed to simulate the act of pinning something to a corkboard and translating it into the virtual world. Genius. Google has become more than just a search engine over the past few years but their homepage has gone down in self-proclaimed history when they decided to diversify the logo. 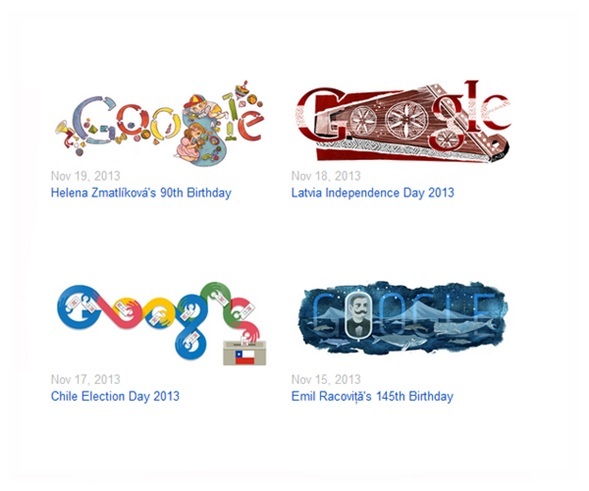 The well-known homepage is simple enough: logo, search box and search buttons, but what makes it iconic are the designs to celebrate national and international holidays, and events and persons of note. They even stepped it up a gear, making some logos interactive with sounds, music and puzzles for users to enjoy before delving into the depths of the world wide web. Liberty has been established in London since 1875 and is one of the finest boutiques in the world. 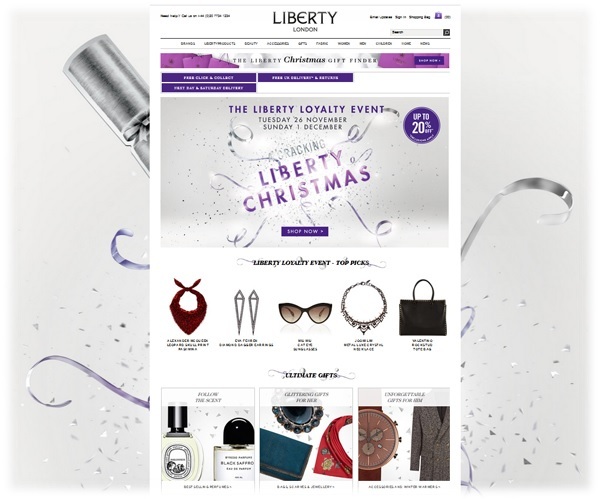 They adopt a design and layout common to companies in ecommerce: the horizontal navigation bar, visual advertisements, feature products, and the history and contacts in the footer – but Liberty do it with style. Far from being cluttered, Liberty is clean, concise and helps buyers navigate to their interests without going overboard. They also subvert that pesky ‘everything must be white’ fad with a seasonal background, making the world of online shopping a little less bleak for everyone. When it comes to web design, sticking to the rules makes sense. These are tried and tested methods. However, it can pay to employ the services of a professional to break those rules and create something brilliant in place of the everyday. It also pays to know what to look for in a web design company, when you’re setting up your own virtual company. What are other sites can you think of that have nailed their site design? Resource Box: Sam is a freelance writer with an eye for the beautiful and an enduring appreciation for websites that are simple, stunning and functional.